The National Park Service is spending roughly $100,000 for a research project seeking to "honor the legacy" of the Marxist revolutionary group the Black Panther Party. 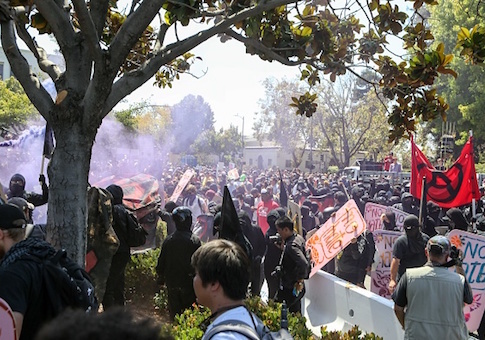 The University of California, Berkeley, which has recently been at the center of violent protests from far-left groups, is receiving funding for the project. The National Park Service announced it was awarding the university a $97,999.70 grant for the project, outside of the normal competitive bidding process. "This cooperative research project between the National Park Service (NPS) and the University of California, Berkeley (UCB) on the Black Panther Party (BPP) is anchored in historical methods, visual culture, and the preservation of sites and voices," according to the funding announcement. "The project will discover new links between the historical events concerning race that occurred in Richmond during World War II and the subsequent emergence of the BPP in the San Francisco Bay Area two decades later through research, oral history, and interpretation." "Committed to truthfully honoring the legacy of BPP activists and the San Francisco Bay Area communities they served, the project seeks to document the lives of activists and elders and the landscapes that shaped the movement," the government said. "Producing an annotative bibliography that includes scholarly texts, newspaper, and magazine articles will be useful for future scholars of the movement. Equally significant, the project will document how the BPP impacted the visual arts, music, dance, and styles of the 1960s, 70s and 80s [and] will underscore the vastness of its impact on American culture." "Bay Area sites that shaped the BPP will be identified in an effort to memorialize a history that brought meaning to lives far beyond the San Francisco Bay Area," the agency added. Request for comment from the National Park Service was not returned. The Black Panther Party was founded in 1966 and originally championed self-defense and the arming of African Americans in California. The party quickly moved to the left, advocating for "revolutionary intercommunalism" and for abolishing capitalism. Black Panther Party founder Huey P. Newton introduced a 10-point platform that called for "an end to the robbery by the capitalists of the black community" and for all black men to be immediately released from prison. The FBI labels the Black Panther Party as advocates for "the use of violence and guerilla tactics to overthrow the U.S. government." The group dissolved in 1982. The New Black Panther Party was the subject of a voter intimidation case when two of its members stood outside of a polling station in Philadelphia wearing paramilitary clothing and holding a billy club during the 2008 presidential election. Original members of the Black Panther Party say the new group, which identifies as a Black Nationalist organization, has no connection to their party. The National Park Service said the goal of the research project is to create a "model for bringing diverse voices and communities together to understand their collective past and inspire a better future." The government said it will have "substantial involvement" in the project, including providing staff and conducting regular reviews of the materials and progress of the work. The National Park Service said it awarded the grant without competition because Berkeley is "uniquely qualified" to produce a history that honors the Black Panther Party. Berkeley has been the location of violent anti-free speech riots by far-left groups antifa and "Black Bloc" several times this year. A mob protesting a speech by conservative provocateur Milo Yiannopoulos in February led to injuries and $100,000 in damage to the university. Masked antifa members threw commercial-grade fireworks, rocks at police, and Molotov cocktails. The school is currently bracing for a planned free speech event with conservative pundits Ben Shapiro and Ann Coulter and Steve Bannon, chairman of Breitbart News and former adviser to President Donald Trump. Berkeley is offering counseling sessions for students offended by bringing the conservative speakers to campus. Police received permission to use pepper spray, which has been banned in the city since 1997, against anticipated violent protesters.